Sober Look: Can the Fed's proposed overnight facility reduce pressure on the repo markets? Can the Fed's proposed overnight facility reduce pressure on the repo markets? Repo rates in the US have seen sharp declines this year and are currently at levels not seen since 2011. 1. Excessive liquidity in the financial system (induced by the Fed) is chasing "secured deposits". Reverse repo provides a way to deposit funds with a bank, but receive collateral in return in order to mitigate counterparty risk. With demand on the rise, rates paid on these deposits have declined. 2. With the Fed buying up the exact same collateral sought by these reverse repo "depositors", the collateral pool is more limited. That competition for collateral suppresses the rates repo providers are willing to pay on secured deposits. The problem is too much cash and not enough collateral. 3. Recent bank regulation proposals (see post) are also beginning to discourage banks from building large repo books with clients. 4. 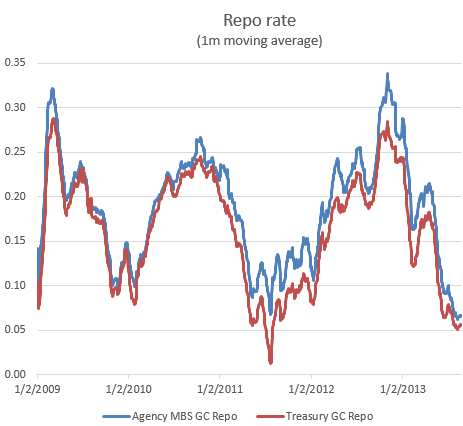 More recently, a wave of short-sellers pushed repo rates even lower by looking to borrow and short increasing amounts of treasuries and agency MBS. Some are betting on rising rates while others simply hedge fixed income portfolios. Given the demand to borrow this paper, banks are paying less on cash proceeds that result from short-selling these securities (note that the repo process is the same as # 1 above except traders look to borrow a specific bond to short rather than accepting "general collateral"). 5. It's also important to point out that treasury issuance is expected to drop off significantly in September (roughly $25bn in bills alone). Furthermore with the debt ceiling approaching and with the US Treasury having accumulated substantial cash positions, treasury issuance will fall further (see chart). That is one of the reasons the Fed should feel comfortable reducing its purchases in September - smaller purchases will not increase the overall supply of treasuries substantially. In light of these developments, market participants are quite supportive of the Fed's proposed "full-allotment overnight reverse repurchase agreement facility" (discussed here) as a method to overcome some of the challenges. The Fed will commit to take as much in deposits as the market wants as long as participants accept the Fed's rate on this facility (some refer to this facility as "all you can eat" or "buffet" .) It will allow market participants that are long cash, such as money market funds, the GSEs, and some corporations to circumvent banks altogether in depositing their cash. The Fed's new facility will likely be executed via a triparty repo that will not allow the Fed's securities to be used as collateral elsewhere (no "re-lending" of securities). Typically the Fed's bonds will be held by custodians such as JPM, BNY Mellon, and State Street. However by significantly reducing demand in the market for general collateral reverse repo, the program should free up a great deal of this collateral which banks currently use for this purpose. And that will end up easing some of the collateral shortages we've experienced in recent years. The rate on this facility should set a floor on general collateral repo rates because large participants will only execute reverse repo with banks (vs. the Fed) if banks pay a higher rate. Unfortunately it may be a while before this facility is in place, since it will effectively sweep liquidity out of the system, reducing bank reserves. And it is unlikely that the Fed will want to reduce reserves via this program while increasing reserves via the securities purchases. That means the tightness in the repo market (low repo rates) may persist for some time, as cash rich market participants look for safe places to park their money.